When was the last time you visited your dermatologist? No, not only because you discovered a problem area. We mean, when was the last time you scheduled a dermatologist appointment just for a checkup? Unfortunately, many fail to make visiting their dermatologist a top priority. Contrary to popular belief, dermatologists are more than just the pros you go to for immediate concerns. Dermatologists are meant to be a part of your routine health and wellness visits. Dermatologists aren’t mind readers. It’s important to speak up about your personal matters and ask the right questions during your appointment. 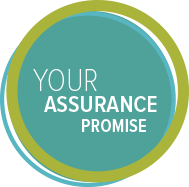 Doing so will help us tailor the consultation process to your needs, so you can get the most of our services. 1. Is my skincare routine working? Whether you’re battling dry skin, acne, or wrinkles, it’s important to ask a dermatologist about your skincare routine. It’s your dermatologist’s job to carefully examine your skin and look beyond the surface to determine whether your routine is in fact effective. 2. Do any of my moles look suspicious? During your appointment, our doctors will examine your body based on your comfort level. This process is known as a skin cancer screening and helps us identify any suspicious moles, freckles, or growths. After evaluating your skin, we’ll inform you on anything that looks out of the norm. If so, we’ll discuss appropriate treatment options. How do you determine a suspicious mole? What’s the difference between a freckle and a mole? Are there any growths I should monitor moving forward? What else can I be doing to protect my skin? Am I at a high risk for skin cancer? 3. Are my supplements and/or medications affecting my skin? During your consultation, it’s best practice to mention any supplements or medications you’re currently taking or may be taking in the future. Having an open conversation about medication with our doctors gives us the opportunity to tell you about the potential side effects they may have on your skin. For example, many prescribed acne medications can make skin very sensitive to the sun. This can increase your risk of sunburns, wrinkles, and skin cancer. However, if you’re aware of this side effect before taking the medication, you’ll be able to act accordingly and better protect your skin. Additionally, birth control pills can affect your skin. Birth control pills adjust and balance your hormone levels. For many women, this helps clear their skin of acne, especially if their acne stemmed from unbalanced hormones. Finally, another common supplement we see that may affect the skin are workout supplements. Depending on their intensity levels, certain workout supplements can cause your skin to break out. If you’re planning on or currently taking these types of supplements, it’s crucial to discuss potential side effects with your dermatologist. 4. Is my skin aging well? Asking if your skin is aging well is another useful question to bring up during your annual appointment with your dermatologist. We find that many of our patients care about the appearance of aging skin. Most ask our professional opinion on this matter. However, when it comes down to it, it’s not our opinion that matters but yours. There’s nothing better than feeling confident in your own skin. By being honest with your needs and working with our doctors—we’ll be able to get you there. 5. What products are a good fit for my skin type? While you have one of our dermatologists in the room with you, you may consider asking them what products they’d recommend for your skin type. Our doctors don’t believe in a “one size fits all solution” when it comes to skincare. Some patients may have oily skin that’s prone to acne, while others may fight the battle of dry, flaky skin. In the end, there are many types of skin and everyone’s is different. Asking your dermatologist which products work best for your skin type helps to achieve your desired results. Our doctors may prescribe medication, suggest one of our medspa treatments, or simply recommend washing your face with a generic cleanser you can find at any drug store. When it comes to skincare, treatment and product recommendations are endless. 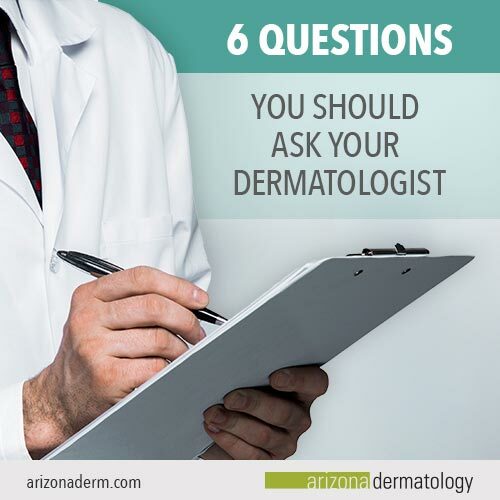 Make sure you’re asking your dermatologist the right questions to get an ideal skincare plan for your needs. 6. Can you tell me about the latest treatments and procedures? Finally, we recommend asking your dermatologist about the latest treatments and procedures on the market. When it comes to hair restoration, skin cancer treatments, skincare procedures, and more, the industry is always changing. At Arizona Dermatology, we run an innovative practice that always offers the latest, most beneficial treatments in dermatology. When coming in for your appointment, make sure you’re asking about these new treatments and procedures. You’ll want to do so to ensure you’re getting the best and most advanced treatment possible. If you’re waiting to see your dermatologist only after a problem area arises, you’re waiting too long. We firmly believe every adult should visit their dermatologist for a full body exam a minimum of one time, each year. Visiting your dermatologist on a yearly basis can help identify and prevent problem areas such as wrinkles, suspicious growths, and acne. Read our article for more information about how often you should see your dermatologist. When coming in for your annual appointment, don’t be afraid to ask your most detailed questions. From suspicious growths and skin cancer, to fine lines, wrinkles, and hair loss—we’ll answer it all. But, we can only do so if you’re honest and open about your personal and medical skin concerns. Remember, if you never ask, you’ll never know. If you’re ready to get your dermatologic questions answered, contact one of our eight locations to set up your consultation appointment.